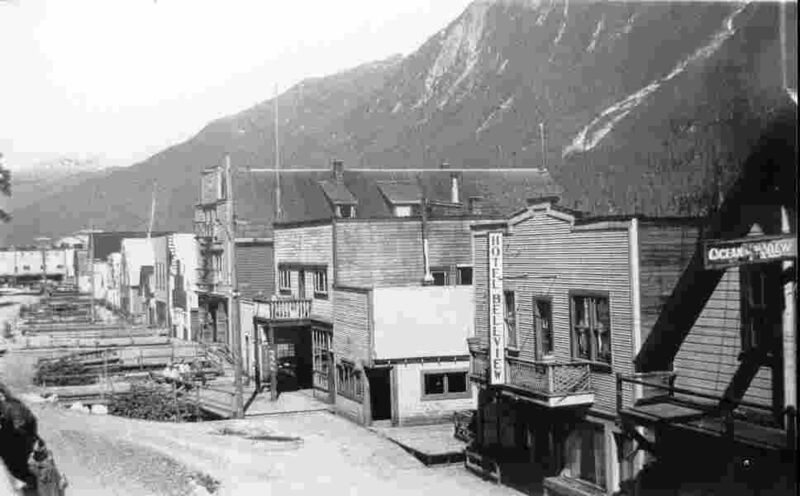 Concurrent with activities on the British Columbia side of the Boundary line, the adjoining Alaskan territory kept pace with advancement, and the town of Portland City was laid out at the mouth of the Salmon River. The name was changed to Hyder when the Lindeborg pre-emption was surveyed into town lots some years later. The Lindeborg pre-emption comprised of 73 acres and the first buildings in the settlement were erected there. They were the log houses of the Lindeborg brothers, Stevenson, and Prowdfoot, Murphy and Irwin, and J. Farvis. A large number of locations have been made on the Alaska side of the line and considerable development done on many properties. One of them, the Riverside mine, which was equipped with a mill produced 500 tons of concentrates before falling metal prices, combined with inadequate milling facilities, compelled suspension. In the early days the difficulties of transportation were very great and the pioneers suffered many setbacks in their endeavors to carry a road up the valley, but a trail of sorts was finally accomplished and the development of numerous mineral locations begun. The road system throughout the Salmon valley is now of the first order and has greatly assisted in the development of that section, providing a direct thoroughfare to the Premier Mine, Big Missouri and other properties in the vicinity, as well as rendering areas further afield more accessibility. Harris and Raerrick, who made the first mineral claim on the Salmon River on the Big Missouri ridge, in 1903, started out with the intension of prospecting the area on the Salmon River side of the mountains on which Mountain Boy claims on American Creek lay. They figured that this section offered good prospecting ground, and headed directly for it, and located their claims there. Practically all the earlier locations made in the Bear and Salmon River sections were made a considerable distance inland, under the impression, probably, that the mineral condition improved with distance. Glacier Creek, although lying close at hand was not prospected until the spring of 1905.